Diageo has submitted plans to convert a building in the heart of Edinburgh’s shopping district into a visitor centre for its blended Scotch whisky brand Johnnie Walker. The drinks giant has stated that the new visitor attraction will be the “focal point” of its £150 million investment to boost Scotch whisky tourism. 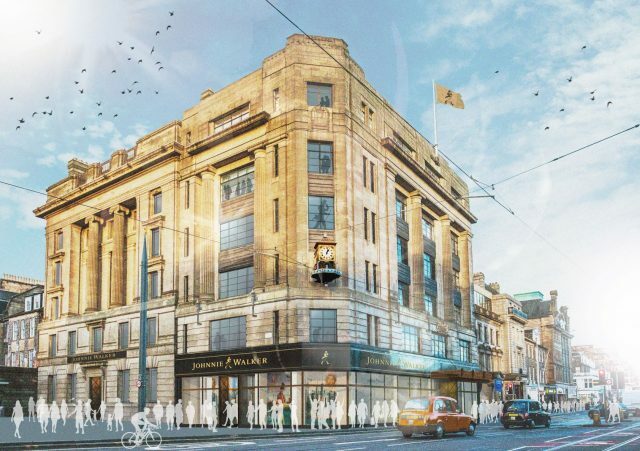 Jointly submitted by Diageo and building owner Parabola, the planning application details proposals to convert 146 Princes Street into a seven-floor visitor experience. The plans include a “multi-sensory, immersive visitor experience” over three floors, covering the brand’s 200-year history as well as the art of whisky production. The building will also include a “flexible events space” capable of staging arts, music, theatre and community events; a bar academy which will be home to Diageo’s Learning for Life programme that provides hospitality training for the unemployed; and a “significant retail space” inspired by the Johnnie Walker retail store in Madrid. Diageo hopes that the new attraction, which will also boast roof-top bars, will create between 160 and 180 full-time jobs and boost the tourism spend in Edinburgh by around £135 million. As part of the project, the building, along with its many heritage features, will be restored and incorporated into the new development where possible. This includes the refurbishment of the clock on the corner of Princes Street and Hope Street, which traditionally acted as a meeting point for Edinburgh dwellers. David Cutter, chairman of Diageo in Scotland, commented: “We are incredibly excited to be able to submit our plans for the Johnnie Walker visitor experience in Edinburgh. Four of Diageo’s distilleries – Glenkinchie, Cardhu, Caol Ila and Clynelish – will be directly linked to the visitor centre and will represent “the four corners of Scotland” with respect to regional flavour variations and blending. As well as its Johnnie Walker visitor centre, Diageo is also investing in 12 visitor attractions across Scotland and has committed to a £35 million to reopen the “lost” distilleries of Port Ellen and Brora. In October 2018, the Highland Council approved its plans for the Brora distillery which include restoring its original buildings, which date to 1819, and demolishing then rebuilding its still house stone-by-stone. Last month, Diageo also unveiled its plans for Port Ellen The plans, which feature two separate distillation regimes which will allow the distillery to both retain its original character and to experiment with different flavour profiles.